For the past two summers, Abby from While She Naps has interviewed sewing bloggers for her series, The Pattern That Changed My Life. It is inspiring to read about people’s experiences with sewing patterns and creative turning points. When I think about my sewing journey so far, I can trace my indie sewing obsession back to my first indie pattern, the Minoru Jacket. It had honestly not occurred to me that I could make something as complex and stylish as the Minoru, having only used beginner patterns from the big 4 pattern companies in the past. I can’t recall how I stumbled upon the Sewaholic Minoru, but as soon as I saw it I began google image searching and admiring all the other sewing blogger’s makes. This was my first experience of the sewing blogging community, and I was immediately hooked. The jacket was completed at the beginning of 2015, but I knew I needed to take some proper photos so I could share it with you on the blog. It took me a while after discovering the Minoru to actually get the pattern, fabric, and notions. It seemed like a long shot that my first jacket would actually turn out, so I bought some green fabric that was on sale for $4/meter and figured I could always try again with nicer fabric. I transferred the pattern markings and cut the Minoru out on my living room floor, since I did not have a decent sized work table at that time. If I remember correctly, the jacket took me about a month to complete once it was cut out. When I originally discovered the Minoru Jacket, I was so impressed by all the pattern variations out there. This was another first for me, learning that I could alter and add to patterns, and that there are tons of online resources to show me how! I decided to try adding a zipper guard and patch pockets similar to Lisa from Notes From a Mad Housewife. I also decided to change the elastic out for a drawstring like Kelly from Cut Cut Sew. Even with these alterations, the Minoru jacket was pretty easy to sew. Sewaholic patterns tend to fit me quite well out of the gate, which is nice because it is so great being able to support a local pattern designer here in Vancouver. As you can see, there are a few lumps and bumps showing on this make, but I am so incredibly proud of it that I don’t even care. My zipper guard, which I love, added quite a big of extra bulk to the top of the zipper at the collar, causing the collar to be uneven when it is zipped all the way up. Luckily, I don’t ever wear it like that, but you can see what I mean in the photos. The jacket has worn well overall, and I wish I could tell you exactly what kind of fabric this is, but I’m really not sure. It is some kind of poly blend and it has thickness to it while still maintaining some drape. It also has a slight sheen, which does accentuate the bumps here and there. I can honestly say it is one of those pieces that looks better in person than in photos, but maybe I have a biased opinion, haha. The fabric lining might just be my favourite part of this jacket. I used the same fabric here as I did for my flamingo flutter top back in July. These darling little birdies never cease to bring me joy when I put on the Minoru, and I have received several compliments on the lining. 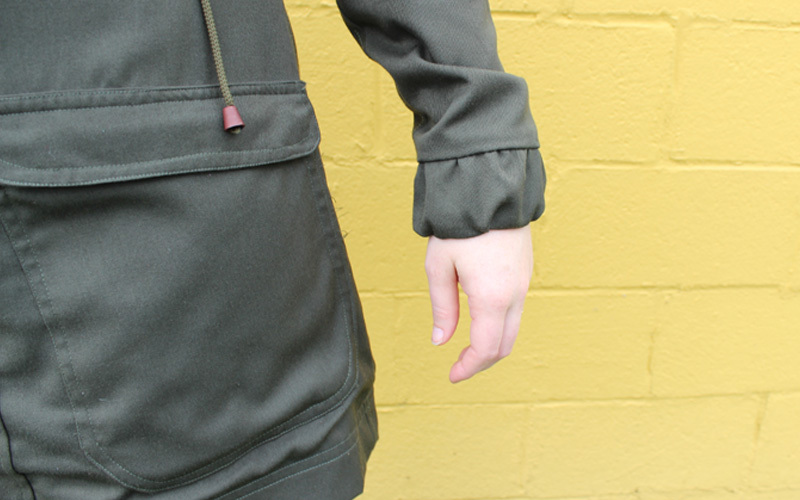 As far as weight goes, the jacket is really ideal for fall-spring here in Vancouver, it is just the right amount of warmth and it has plenty of ease inside to fit a sweater if needed. The ease also makes the jacket extremely comfortable. I have full range of motion with my arms, which is something that jackets tend to restrict for me due to my broad shoulders. I wear my Minoru all the time, it is by far my favourite jacket. After sewing the Minoru I bought 5 other Sewaholic patterns and so the indie sewing love affair began. I started Helen’s Closet a few months later and I have been so happy sharing my makes with you all and improving my sewing skills. Thanks to Tasia for creating the pattern that changed my life! Do you have a creative turning point that you can think of or a pattern that changed your life? great jacket! Love the flamingos. The sense of accomplishment is one of my favorite things about sewing. Right? It is the best feeling 🙂 Thanks! Great post and a great jacket Helen! It’s nice to hear your origin story! Great jacket Helen!! I love the colour! This jacket is just lovely, Helen! I love the color… you are reminding me that I really want to try this pattern… I’ve got it in my stash, just have to find the perfect fabric! Thanks, Meg! I cant wait to make another one…so many patterns, so little time, right? I highly recommend it, it’s a very comfortable and versatile coat.